Romantic comedies can often be a dime a dozen with about as much substance contained in the atmosphere of Mars. Of course, there are brilliant, diamond-like exceptions such as 2017’s “The Big Sick” or 2012’s “Silver Linings Playbook.” While the new “Crazy Rich Asians” may not be nearly as creative or fulfilling as those movies, it’s still at least as good as an unpolished sapphire. Directed by Jon M. Chu, best known for such “legendary” works as “G.I. Joe: Retaliation” and “Now You See Me 2,” “Crazy Rich Asians” is based upon the 2013 novel of the same name by Singaporean/American novelist Kevin Kwan. It begins in a flashback when Eleanor Young (Michelle Yoeh, “Crouching Tiger, Hidden Dragon”) is denied entrance into a posh New York City hotel when the white manager sees that she is of Chinese descent. What the racist manager doesn’t know is that Eleanor and her husband, whom we strangely never meet during the movie despite being very much alive, are the hotel’s new owners. It’s a scene that sets up her fierceness, which we later see in an unfavorable light. Flash forward to present day when brilliant American economics professor Rachel Chu (played sweetly by Constance Wu, “Fresh Off the Boat”) is invited by her longtime boyfriend Nick Young (British/Malaysian actor/model/TV host Henry Golding) to his best friend’s wedding in Singapore. However, charming Nick has not been completely forthright with Rachel when he reveals on the plane that he comes from a wealthy Singapore family, the scope of which she is too naïve to fathom yet. Upon their arrival in Singapore, Rachel is swept away by a night out in Nick’s vibrant hometown with his best friend and his fiancé. Despite descriptions he gives of his family and their business empire, it’s not until Rachel visits her outlandish college friend Peik Lin Goh (Awkwafina, “Ocean’s 8”) that she learns just how influential the Young family is. The real problem, though, is not necessarily the vast gulf between Nick’s upbringing and hers. Instead, it’s the fact that she is an American of Chinese descent and not directly from China, which is something Eleanor is less than fond of. So, between Eleanor and a myriad of jealous, petty Singapore girls who do everything they can to drive her off, Rachel has her work cut out for her if she wishes to see her relationship with Nick continue. 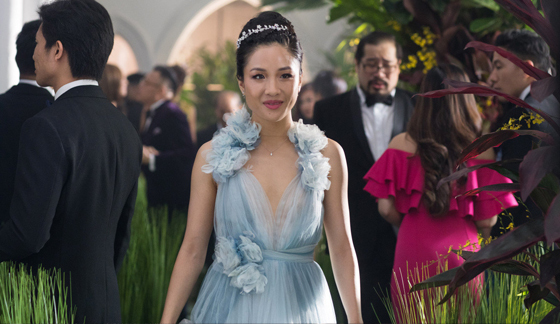 “Crazy Rich Asians” has nothing all that new to offer to the romantic comedy genre. It has all the prerequisite boxes you can check off like clockwork – resistant parents of one or both members of the couple; crazy, jealous exes; a goofy best friend that can always be depended upon; a goofy friend that no should ever count on; an impending marriage of some sort; etc. In that sense, “Crazy Rich Asians” is about as crazy as a block of wood. 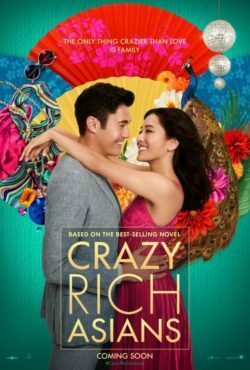 Despite its stereotypical characters and plot we have seen a plethora of times in various forms, “Crazy Rich Asians’ still manages to be an entertaining flick. There are plenty of genuine laughs to be had, especially in scenes involving the hilarious Awkwafina and/or her character’s equally goofy father played by “Hangover” alum Ken Jeong. The romance itself will undoubtedly pull at some heartstrings plus there is a fantastic side story of eventual female empowerment that will make anyone feel good. All in all, “Crazy Rich Asians” is a great date flick for any couple of any age, but don’t expect go into expecting to see something that truly separates itself from general, romantic comedy fair.